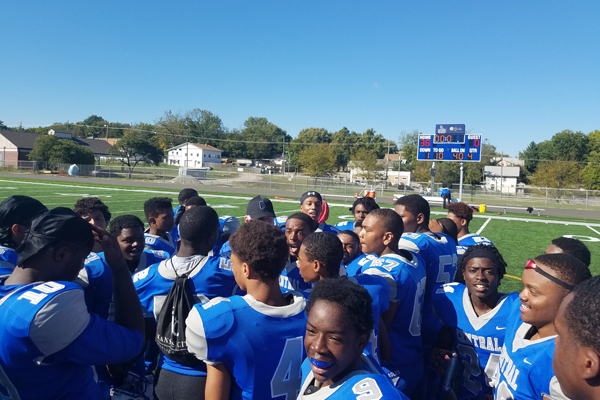 Central went into its Interscholastic League showdown against defending champion Lincoln Prep with a collective chip on its shoulders. The Blue Eagles had been stymied the last few weeks and entered Saturday’s home game on a four-game losing streak. With a quartet of seniors leading the way, Central shut down its league rival with a suffocating defense and a revived offense en route to a commanding 38-0 victory. The victory helped Central (3-5 overall and 3-1 in league) claim a share of the IL title. Lincoln, winners of three straight heading into the game, fell to 3-5 overall and 3-1 in league play. If Southeast (2-6, 2-1) defeats East Oct. 14, the teams will split a three-way tie for the title. The Knights lost to undefeated and No. 5 ranked Class 1 Lincoln in a non-league contest Friday. The aforementioned seniors circled around Supplee near mid-filed after the game and exalted. The crew had just notched its first league title in four years of varsity competition and wanted to share in the revelry with their coach. Four-year varsity letterman Dre’Shaun Sanders, a wide receiver and defensive back, sighed. Fellow senior and linebacker Craig Robinson said the Blue Eagles persevered through a tough four-game stretch that culminated with a shutout win. Rejaun Campbell, a senior wide receiver, said he was exhilarated to be a champion. Senior quarterback Javion Shelby, finally healthy after suffering a shoulder injury in Week 5, said revenge is a dish best served with offensive firepower and defensive prowess. Lincoln defeated Central 62-58 in Week 8 last season to claim its third IL title in the last four years. The Blue Eagles led 20-0 at halftime, 32-0 after three quarters and ushered in a mercy-rule running clock early in the fourth. Lincoln head coach William Lowe said he anticipated Central coming out on fire. The Blue Tigers, Lowe said, started 10 freshmen and sophomores in the game.